At some time many of us have thought about taking photographs of places before they change. Few us actually get round to doing it. But Malcom Astley did. 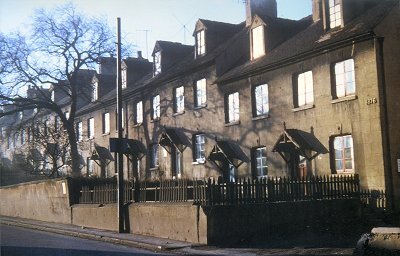 He has kindly let us have these colour slides which he took in the 1960s. The retail market hall and, on the left, the frames of the market stalls on the market patch. 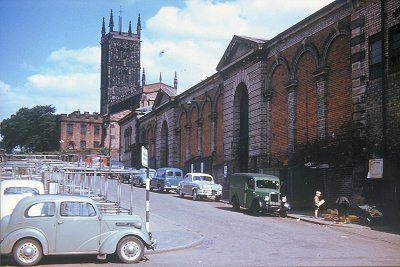 The North Street facade of the retail market hall, looking towards Queen Square. 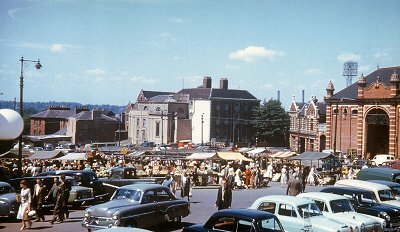 The open air market in full swing, with the wholesale market to the right and Giffard House and St. Peter and St. Paul, the sole survivors in this scene, near the centre. 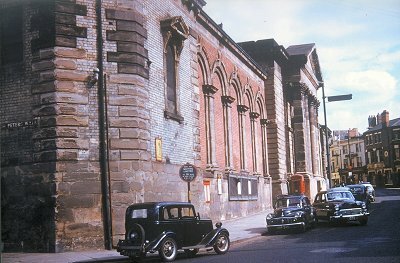 This is the east side of Snow Hill, before the Wulfrun Centre replaced it. 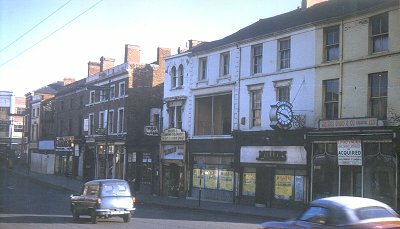 Hawkins household goods store was on the corner with Bilston Street. 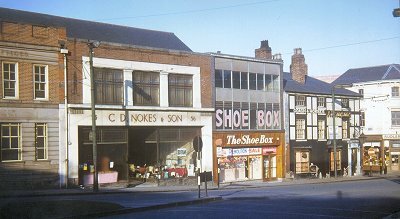 Note the remarkable 1930s fascia to Craddocks' dress shop. The same side of Snow Hill. On the extreme right you can just see Fosters, only recently replaced by the glass block tower. 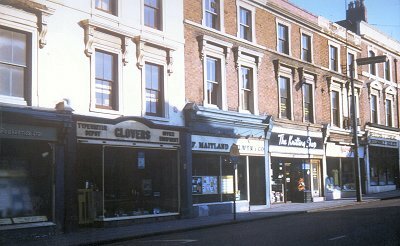 On the right the premises of Arthur Dodd and Co have already been acquired for the redevelopment, and Miller's is closed. (What happened to the clock?). Tweedies "Sports and Camping Equipment, Scout and Guide Depot) is still open. 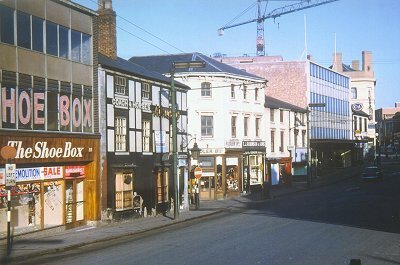 On the opposite side of Snow Hill, the large crane was probably for building the Mander Centre. C&A, afterwards T.K.Max. Everything else in this direction is now within the Wulfrun Centre. The well-remembered Coach and Horses is closed but, strangely, has a "To Let" board above the window. More realistically, the Shoe Box announces a "Demolition Sale". 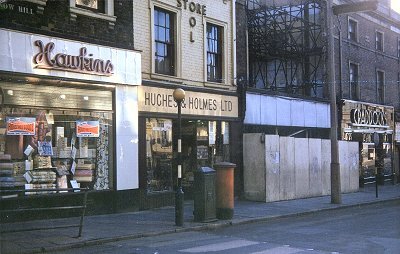 C. D. Nokes, the furnishers, have moved out and the shop is being used by Oxfam. Almost directly opposite C. D. Nokes. 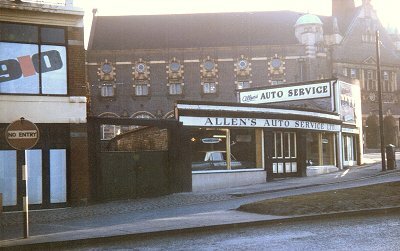 Allen's Auto Service seems to be still open, with a Cortina displayed in the window. 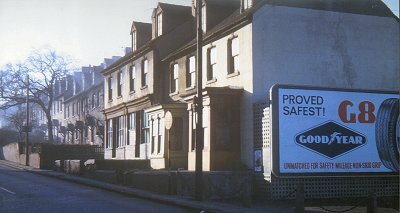 Moving across town, this is the lower end of Darlington Street. Malcolm also got out to Heath Town to record this fast changing scene. His photos remind us of just how much so many parts of the town changed during this period. And it was not just the streets and buildings which changed. 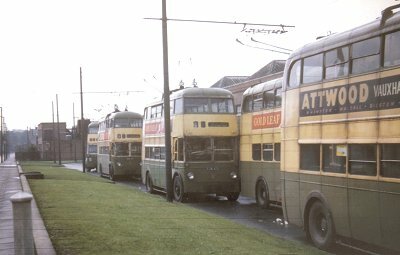 These trolley buses, amongst the last of their breed, are at Park Lane Depot. 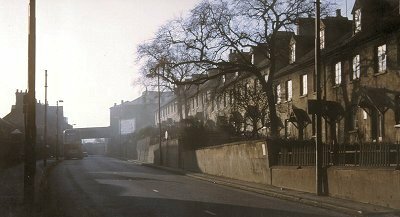 And late one winter afternoon Malcolm walked up Stafford Road to record these atmospheric pictures of a scene that was soon to vanish. A little further up the road, these Victorian terraces houses, with their dormer windows and funny little porches, catch the last of the light. 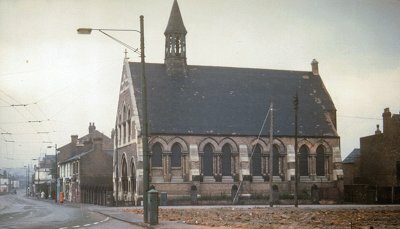 A final view of Stafford Road.